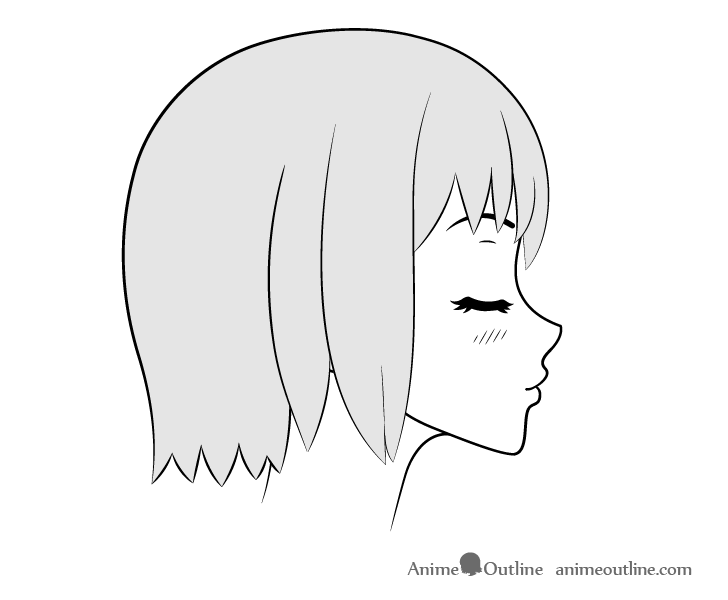 This tutorial explains how to draw anime kissing lips and face from two different views with the head at different angles. 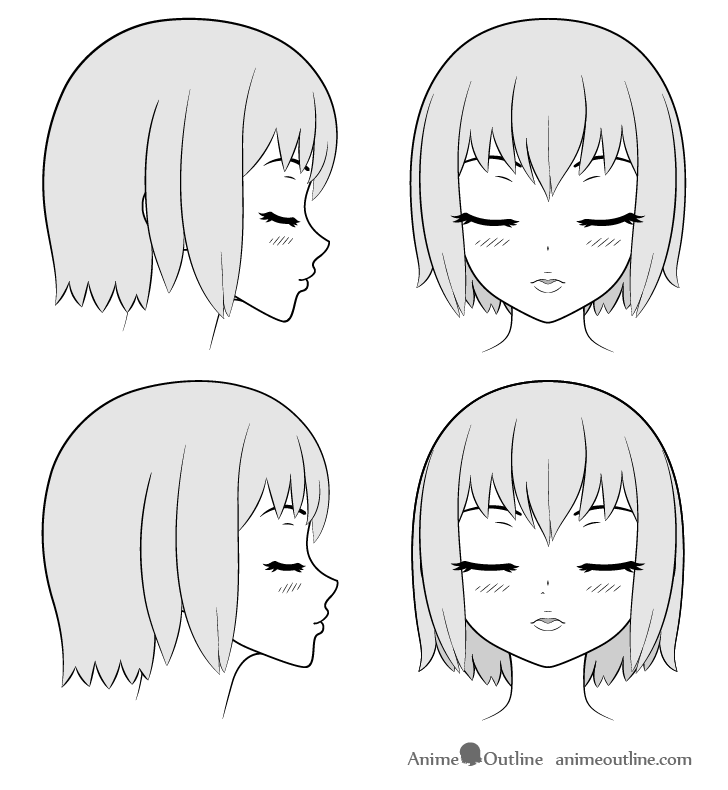 The main focus of this tutorial is on showing a “kissing” look on a female anime face but it can also help you if you are looking for an easy way to draw the head at different angles. 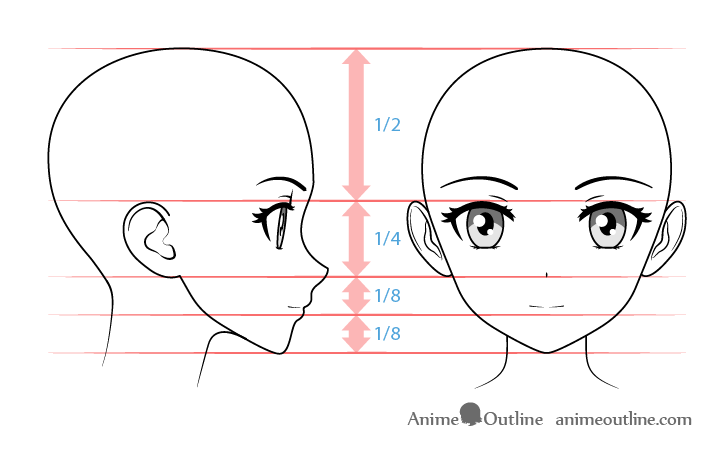 Anime characters are usually drawn without showing the lips. However in certain expressions as well as well as close up scenes of the face lips can be fully or partially shown. 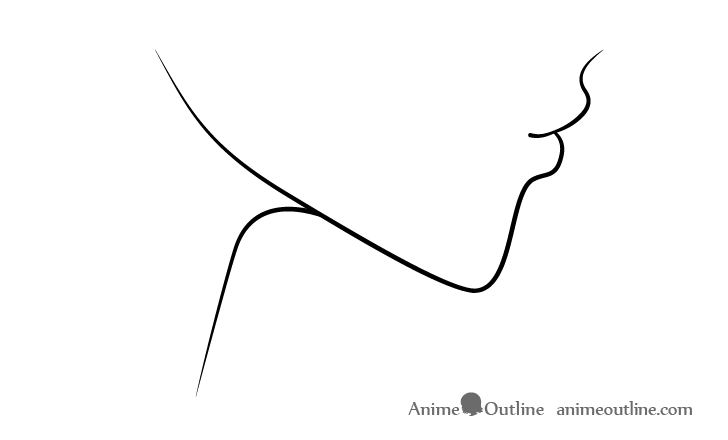 For kissing anime lips draw the mouth slightly open with the top portion similar to a flattened “M” shape and the bottom portion similar to a flatted “U” shape. Give a hint of the top lip with one tiny curve and the bottom lip with two large curves that join in the middle. 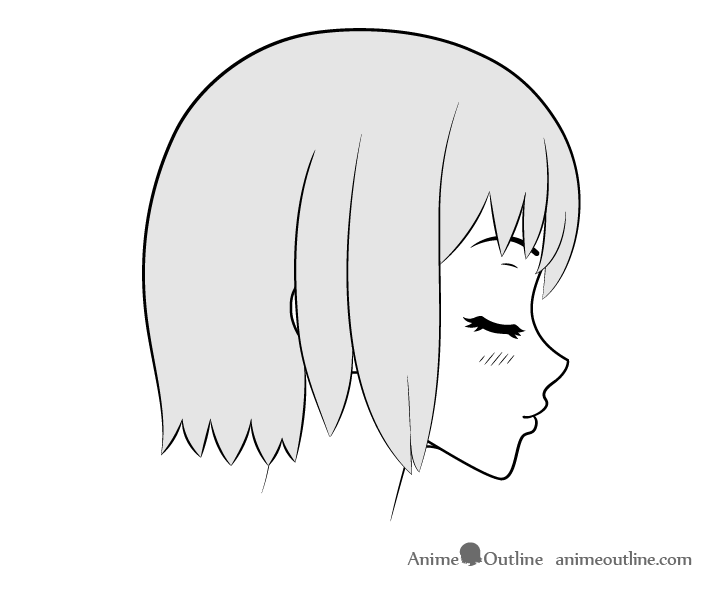 For the side view you can draw anime lips very similar to real lips but leave them as a silhouette without showing inner details. Above and below you can see the proportions of the face used for this tutorial. 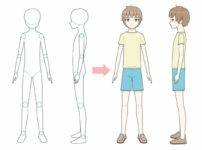 You may already be aware of these if you’ve seen some of the other tutorials here on AnimeOutline. 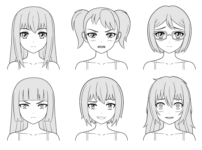 Finally you can see how the facial features shift when making a “kissy face” as compared to a normal expression. You may also notice some blush added to the cheeks. You can draw the blush with just a few stripes. 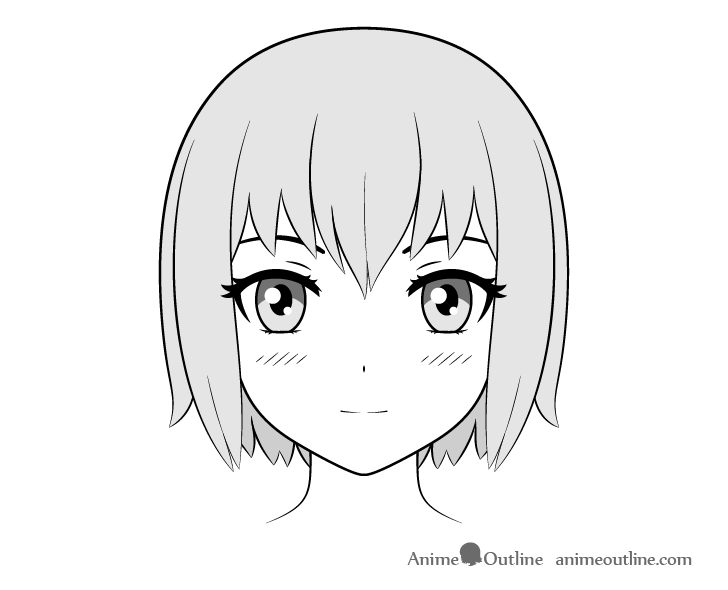 For reference you can see how this character would look with their normal expression with the head and face fully drawn. You can also see the side view drawing example above. 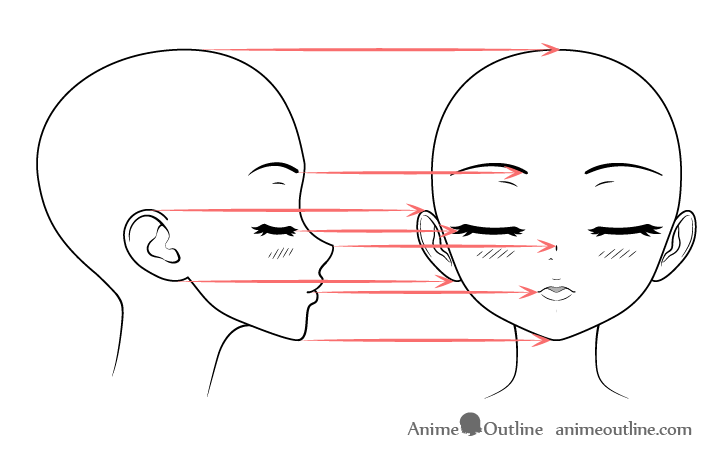 To draw the “kissing face” in the front view position and draw the facial features as described earlier (closed eyes, lightly open mouth and blush). Above you can also see an example of the same face drawn with a “kissing expressions” from the side view. 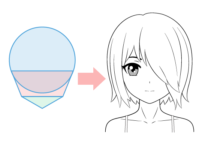 This example can work when drawing a character that is kissing someone slightly below them. For example if she was kissing her smaller sister/brother on the forehead. But often the head tends to be tilted upwards when giving a kiss on the cheek or lips so the above example will not always work. 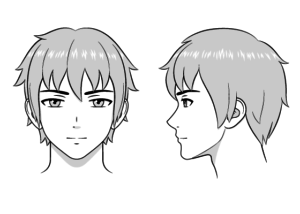 In the side view an upward tilted head is still fairly easy to draw. 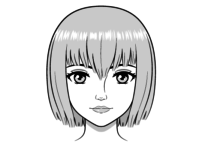 You can basically rotate the previous drawing of the face. The only tricky part is drawing the hair. 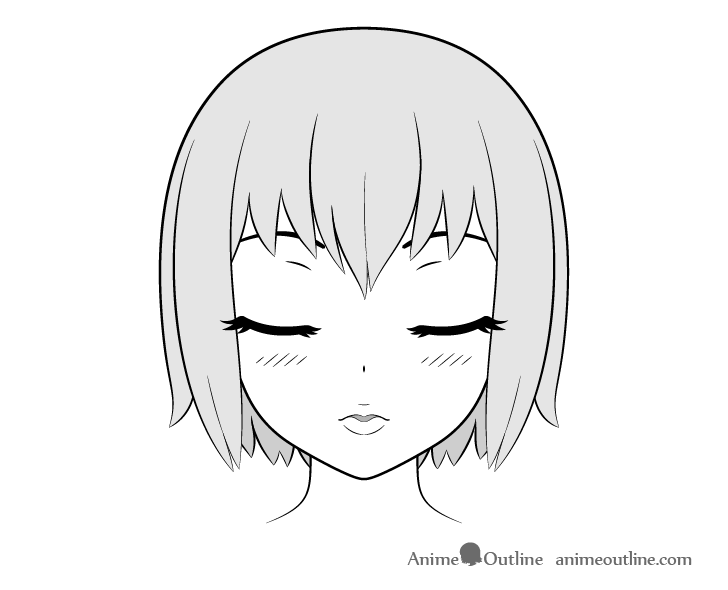 Draw the top part of the hair rotated along with the head and the shorter clumps slightly more angled in accordance with the tilt. 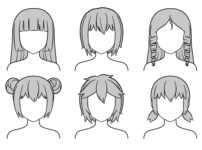 Keep the longer parts of the hair hanging downwards same as the previous example. Basically the longer the hair the more likely it is to simply hang down. Very short hair will pretty much rotate with the head and medium hair will tend to bend downwards but not fully hang like long hair. Finally the most challenging example of this tutorial. 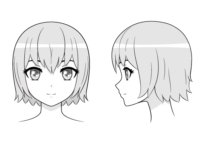 Drawing a head that’s lifted up in the front view can be quite tough because all of the facial features and proportions will shift. 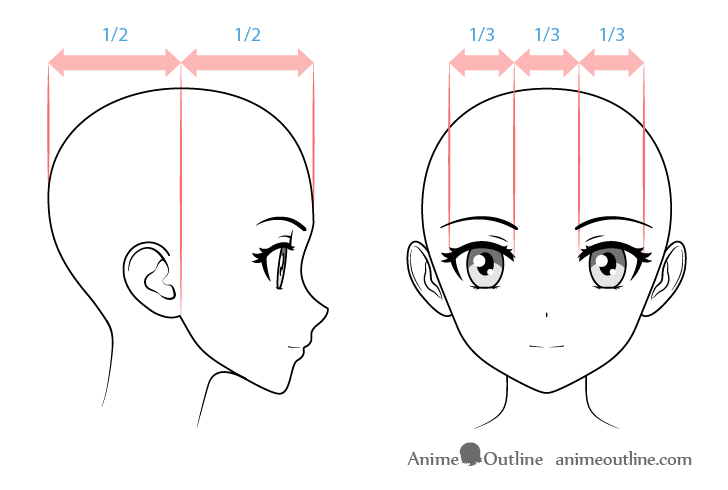 However you can use the technique below to make drawing an angled head significantly easier. 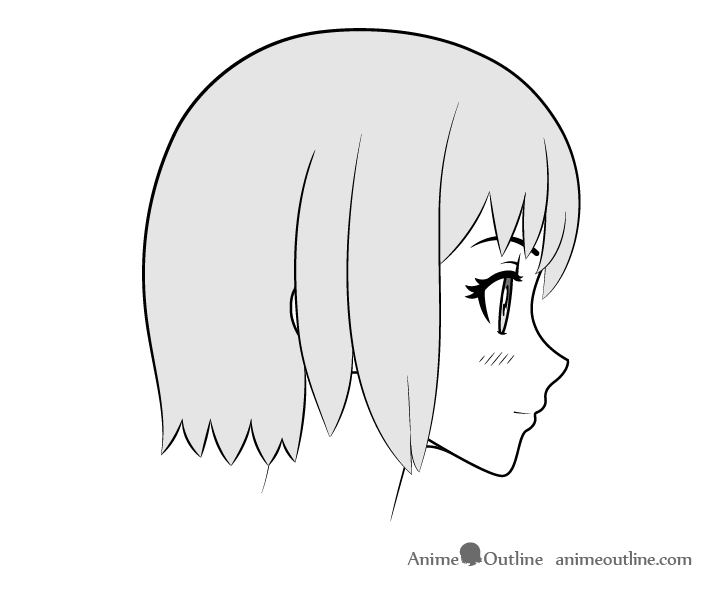 A good trick to use to if you are struggling with drawing a head that is raised (ore lowered) in the front view is to draw that same head from the side view. Next project a set of lines from each of the major facial features. 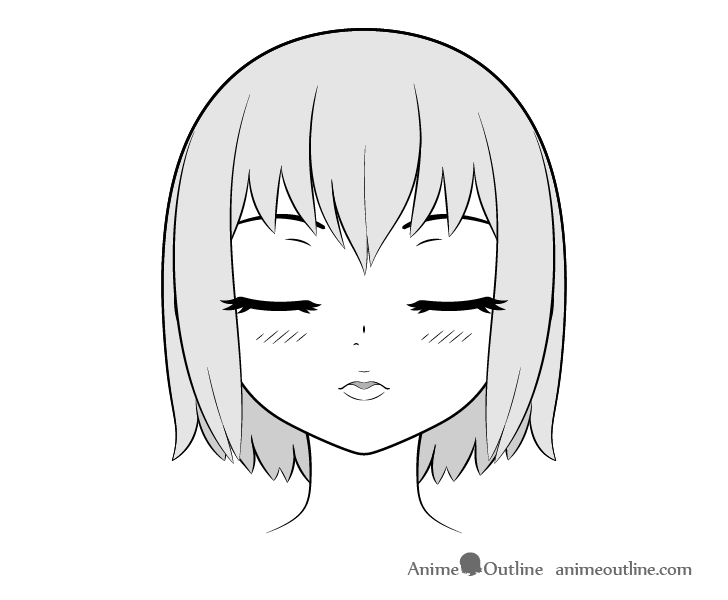 These lines will give you the placement of the facial features of that same head angle in the front view! 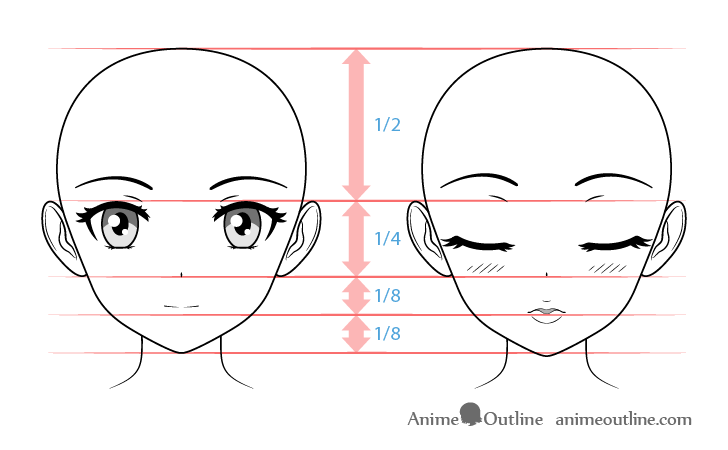 Please note that you do not need to do this every time you draw but it can be very good practice until you get the hang of how to draw the face at different angles without the extra help. You may also notice that there is a hint of one of the nostrils on the left side of the face. This is optional but can help show that the head is tilted upwards. 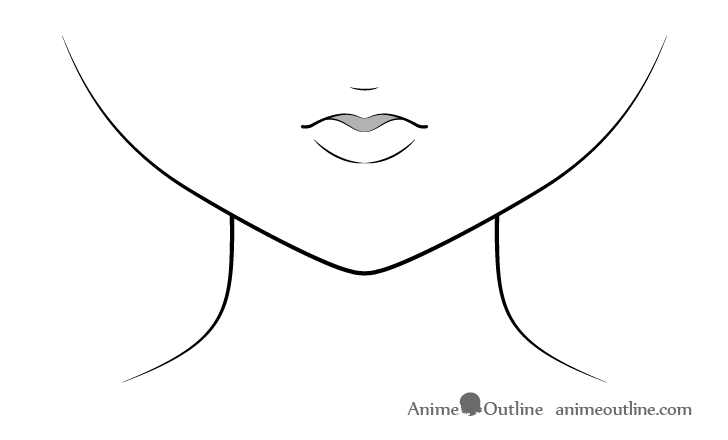 Drawing kissing anime lips is fairly simple but drawing the entire face (especially from different angles) can get a lot more complicated. Hopefully the tips and suggestions provided in this tutorial have helped you gain a better understanding of how you can draw these.